The waiting train looked as if it had been tacked together from a bunch of left over bits and pieces. I’m assuming this is because it had been tacked together from left over bits and pieces, but from certain angles it made sense. The branding described the possibility of a tourist honey pot, but somebody wasn’t working hard at achieving in reality. I had a number of options for seating, the ‘turista’ class at 45 pesos being the cheapest. Putting that in perspective it’s a journey of over 800 kilometres for just over 7 uk pounds. I decided to splash out on a slightly posher reclining seat for 75 pesos as there were no sleepers (at 200 pesos) available, I had booked a little too late to have much more of a choice. The train quickly filled with people attempting to move mountains via the overhead storage. I had a seat empty next to me and was stationed at the very corner of the train. I did feel the need to lock my bag to the overhead bars, but after asking a few locals to keep an eye out, felt secure that the pervading Catholic sense of right and wrong was strong in the majority. They looked like a kind bunch. The reclining seats were slashed and in poor condition, the train tatty. Toilets the kind of open stainless variety you might find on an Indian train, but when you popped up to the sleeper carriage things were a lot tidier. Simple things like soap and a hand washing basin in the rest room. Two diesel engines pulled the train, one in front of a car carriage and one behind, this train really did look like a mongrel with it’s functional engine, carriages some branded with a neat little ‘Tren Patagonico’ logo, some not. I can see why popping your car on a train would save it’s undercarriage as most of the road across Argentina is unpaved. But I must say that the car carriages were a surprise, as was the on-board restaurant and the cinema. After securing my place on the train I felt secure enough to float about soaking up the atmosphere. This was the first time I had experiences such a mixture of Argentinian life, I had stayed in a succession of tidy Swiss/Germanic towns for my time in the west of the country and now here was The Argentine heirarchy exposed in a neat way. There were impressive looking older gents wearing traditional dress, baggy caps and pleated trousers tucked into leather boots. Entire families trying to occupy double seats, some choosing the floor in the turista class, but the sense of excitement at passing through the Argentine interior was the thing that occupied me most as we set off. We passed by the great lake next to San Carlos de Bariloche and soon left the greenery of the lake district behind. I had fallen in love with the Andes Region with it’s impressive landscape and gorgeous mountains, but as the sun went down a different, desert region of rock sculptures and carved horizons awaited. As we had departed at 5pm (Every Sunday) it didn’t take long for the sun to paint the rainbow hues of sunset, the shadows growing long from the fingers of stone, the flat topped structures, the rolling dry hills. The timing was perfect, I had had my face glued to the window drinking in the scenery, no was time to drink some wine. Earlier, a waiter had travelled through the train booking times to eat in the trains restaurant. My allotted time was Eleven pm, but people eat late in Argentina so this was not abnormal. In the restaurant the choice was of Steak, Milenesa (thin breaded steak) or Ravioli. I tend to play safe when on the move and went for the vegeterian ravioli, but the other choices looked well cooked and healthy when I saw them delivered to other people. One thing I haven’t experienced in South America is problems with food hygene and the restaurant on the train looked very good. The restaurant car itself was bright and the presentation good, I felt as if I was now in the first world part of the train and enjoyed my Ravioli, red wine and good company. I was lucky to join a couple of people on my alloted table to pass a fine meal with. One of them, a Mexican chap called Weston Hankins, is the technical director at couchsurfing.org. We passed a few hours talking of many different things, Weston having an enthusiasm and pluralism that only someone who passes their lives bringing people together can have. Couchsurfing.org has over 2.5 million members at the moment and is an innovative way for people to meet each other whilst transcending cultural barriers. Plus just have a good time of course, but this bit of the agenda has to be played down when applying to governments for cultural grants. As I make my living on the internet I felt this to be a resonant meeting, perhaps even more so because we only briefly chit chatted about what it is we do, perhaps because doing it was more important and there was an interesting third party at the table who talked of Argentinian life and customs. One wonderful thing that I did do with Weston was to resurrect my interest in couchsurfing. For certain reasons I hadn’t become too involved, yet my lifestyle and philosophy suit the idea of couchsurfing so perfectly that it seems stupid that I hadn’t, so we made a pact that I would do more to become a part of wonderful project. We also shared some beer and wine, so it soon became time to get some sleep. This proved to be more problematic than I thought. When I got back to my seat it was occupied by a gorgeous little nest of a mother and her children. There was no way I was going to turf them out of the seat so I went back to the restaurant that had miraculously turned into a smoking/drinking bar and drank sat talking to an old fella whith insomnia until daybreak. At this time I returned again to my seat and insisted that I join in the snug, so I cradled a few children like cats, watching the sun paint the day into life again. I smiled in contentment, it all fitted so wonderfully together, I holding new life whilst watching the day being born anew. The train also had another attraction that surprised me which was a cinema car. In the cinema were screened movies all evening, but I was too mesmerised by the passing scenery and the animated conversation to be bothered with a film, but it seems that you have a car with four seats abreast with a screen at the end, which is great for the little ones who need something engaging to keep them from wrecking the train. The desert didn’t give way to greenery again until we hit Viedma, and that was only when I walked into town and tripped over a sprinkler. The scrub travels right across the country until the Rio Negra waters the neat little towns of Viedma and Carmen de Patagones on the other side of the river. I stayed for a few days in Patagones, then hopped on a bus and went all the way back to Bariloche again. I missed the mountains too much and it was nearly Xmas when a chap has to see a little snow. 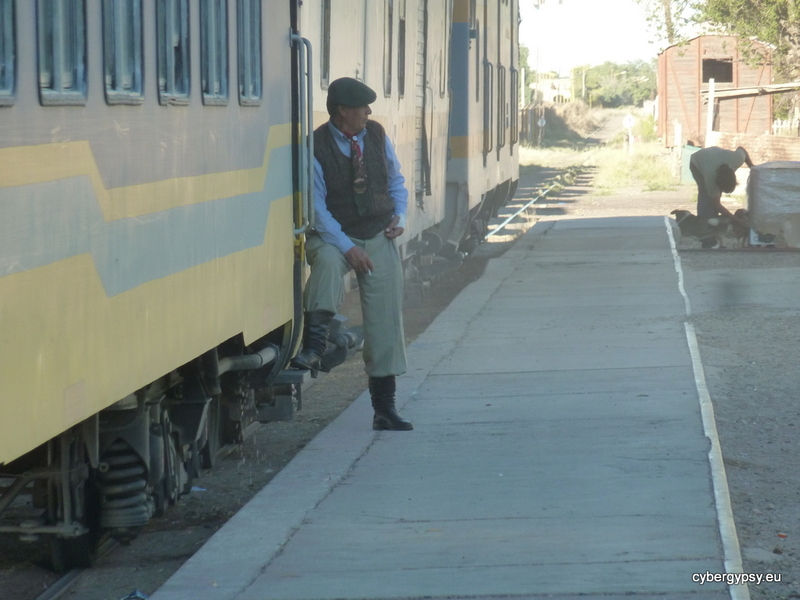 The train journey was a wonderful moment in my South American travels, cheaper than a night in a hostel dorm and a lot more interesting, I recommend it to anyone. Sounds like a great journey. A cinema car too. And what amazing luck you had with your travel companions! We are looking to do this next week! How far in advance did you need to book your ticket and where did you buy it?